This place has to have one of the weirdest layout for a restaurant. Tables are lined outside the actual "restaurant shop" and inside the air-conditioned area, there are only place for a few tables. The rest of the space is for a large bar area. Not exactly very cozy and it is not easy to find (behind the church at waterloo). I tried the crusted salmon pasta and it was average. The salmon was alright but the pasta wasn't very flavorsome and pretty oily. Not recommended. High-end caterer now an open bistro! I know the food from Fine Palate through some corporate events I've been to in the past. And am now excited that anyone can go to their new restaurant on Waterloo street to eat the same delectable dishes once only exclusive to high-end corporate events. The owner, Heather Barrie has become famous for her high-end cuisine over the past 20 years here and it's to see she is offering her superb food to the general public. Without the high-end price tag! I've been several times now and have never been disappointed. 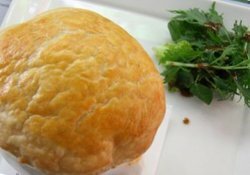 The servings are more than you would find anywhere else, and the quality of the ingredients feels like you're eating at a 3 star Michelin restaurant. The steak wraps are fantastic. 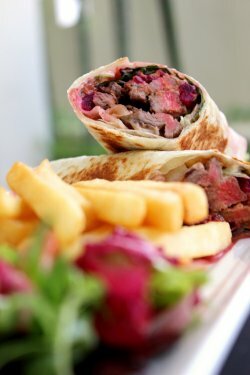 Succulent slices of perfectly cook steak wrapped in a tortilla with hummus, beetroot, lettuce and other fillings. And the wasabi manonaise is awesome. The pizzas are great as well. Thin crust with gourmet toppings. 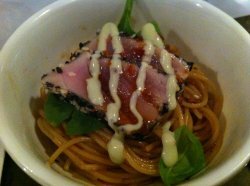 Most of my guests ordered the tuna capellini salad which was sushi grade tuna on top of japanese noodle with a light dressing. Sunday brunch is great atmosphere here and probably one of few places that get the eggs just perfect for their Eggs Benedict. The bread, chips and everything else is all homemade as well. You can certainly notice that the 20 odd years of high-end catering for luxury brands and major corporations has been transfered to this flagship restaurant. I'm taking more clients there for business lunches.